Attention all struggling Freelancers, people who want to earn Passive Income and those who want to launch their Bitcoin affiliate website and make money online. Do you want to earn passive income? But don’t know where to start? Bitcoin's price is rising rapidly, why not take the advantage of this? Do you know that having your own bitcoin affiliate website, makes you a passive income? If you have answered YES, then you are at the right place…!!! Here is the Bitcoin Blueprint course, your complete guide to launch your own Bitcoin affiliate website and how to make a Passive Income from it, a Step by Step Guide. This course is designed for the anyone who want to launch their own Bitcoin affiliate website, struggling Freelancers, anyone who is looking to earn passive income online. And best part of this course is you do not require any website creation experience! You just need to spend a little time to create your website. 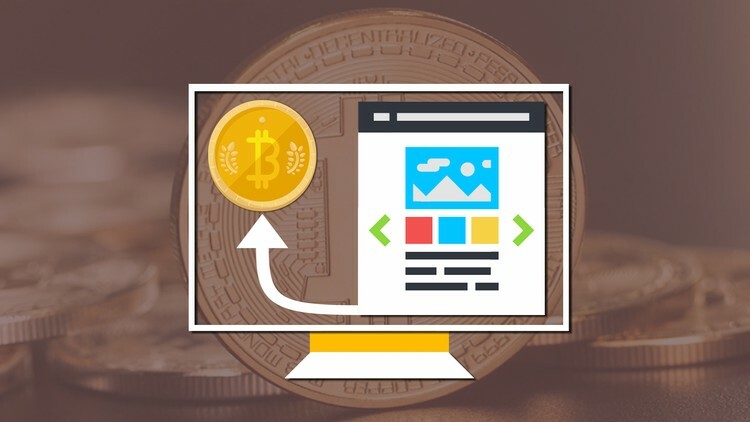 In this course, we will use Weebly Website Builder to build Bitcoin affiliate website, but this should work with any other similar website builders. This course starts from identifying and helping you with the requirements to launching a Bitcoin affiliate website. You will learn how to create the website, how to monetizing your website, how to make Bitcoins commissions, how to buy and/or sell your Bitcoin on your website and earn a passive income. We will also cover the best place to promote Bitcoin affiliate websites in this course. This course demonstrates you, how to monetize your own website with several bitcoin ads, referral programs, bitcoin products etc. We will also cover the best place to promote Bitcoin affiliate websites in this course. Section 1 – Course Introduction: In this section, we will have introduction to the course. We will talk about what are the course prerequisites, course objectives, who are the targeted students for this course and understand the outline of the course! Section 2 - Before You Start with Your Bitcoin Website: In this section, we will identify all the requirements to create and launch a Bitcoin affiliate website. I will help you to save a lot of money on your domain, how to create a name and a logo quickly. We will also see some of the example websites and learn from them. Section 3 - Creating Your Bitcoin Website: In this sections, we will learn how to set up your simple but professional Bitcoin website. We will also see an easy way to write original content for your website. Very easy and takes so little time! Section 4 - Monetizing Your Bitcoin Website: In this section, we will look at the ways to monetize our Bitcoin website. We will learn how to buy or sell your Bitcoin on Bitcoin website, how to get affiliate clicks, how to promote Bitcoin affiliate website, places to promote, how to get AUTOMATIC bitcoins, etc. Section 5 - Other Ways to Monetize Your Website Without Bitcoin: In this section, we will learn the ways to monetize your website other than Bitcoins. We will learn how to post Bitcoin classes on website, how to make a free professional Bitcoin store, how to sell informational Bitcoin products and how to sell the space on your website easily. Section 6 – Bitcoin Website Content and Distribution: In this section, we will learn how to distribute the contents created using different platforms such as YouTube, email lists, sign up’s etc. This will help to build a strong audience and improves the views and visits on Bitcoin affiliate website. Section 7 - Conclusion: In this section, we will summarize what we have learned in all above sections with a quick overview of the course. I will show you some of the proof from my own account that the concepts we learned in the course makes a Passive Income! Students who love this course! After taking this course, you will able to launch your own Bitcoin affiliate website and start making money from it. An investment in this course will enable you to earn in future. Don’t procrastinate. There is no time like the present to take charge of your Freelancer career. Take this course and start working on building your own Bitcoin affiliate website Today! You have 30 days’ money back guarantee…!!! And remember that once you purchase the course you will have lifetime access to the course and you have a 30 days’ money back guarantee if you do not like the course because of any reason. So, what are you thinking? Go ahead and click on “Enroll Now” button. See you inside the course…!! !